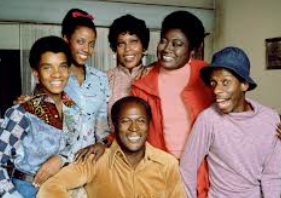 Update: On 4/27/15 Entertainment Weekly stated that Sony has tapped Black-ish creator Kenya Barris to write the script for the movie version of Good Times, EW has confirmed. Scott Rudin and Eli Bush are producing the film. Wreck-It Ralph and Cedar Rapids screenwriter Phil Johnston was first attached to write when the movie was announced in March 2013. Eric Monte, Tammie Evans and Carlena Harris will executive produce, while William Bannister, Michael Daniels and Neville Mouguel will serve as associate producers. Details: Film based on the 1974-1979 CBS TV series created by Mike Evans & Eric Monte. Set in the 1960s, working-class couple James and Florida Evans raise three kids while struggling with hard financial times, unemployment and keeping their kids away from temptations that come with living in a Chicago housing project. Source: Movie Insider. This entry was posted in Rumoured or Announced Projects and tagged Good Times, Remake, Sitcom by blackcinemaconnection. Bookmark the permalink.